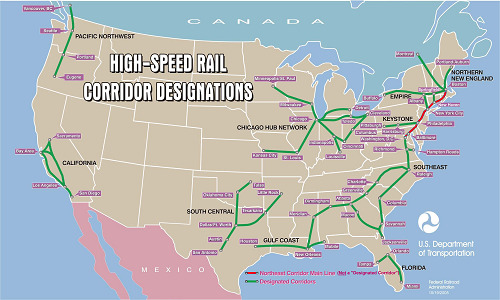 The Obama Administration recently laid out their plan for investment in a national network of High Speed Rail lines across the United States. This investment includes $8B to be generated from the $787B stimulus plan along with a proposed $5B coming from his proposed 2010 fiscal budget. On the grand scheme of things this is a drop in the bucket, and seemingly light years away from China’s initiative, but I guess you need to start somewhere, right? According to a recent article in the China Daily, China is “poised to become the world’s High Speed Rail leader.” They are set to build 42 new high speed lines spanning a total of 13,000 km over the next three years. And while our current administration is contemplating how to spend $13B in high speed rail, China is investing $300B in their high speed rail initiative by the year 2020. If a country as smart and as talented as China is blazing this trail, shouldn’t we be more aggressively following their lead? The information available on this topic is endless. I believe High Speed Rail to be a great and necessary alternative, but like everything else, it boils down to money and acceptance. The proposed $13B investment is a nice start, but where will we get the funds to finish? And once these High Speed Rail lines are up and running, will there be enough funds from rider revenue, taxes, and government subsidies to keep up with the cost of operations and maintenance? I believe that one day High Speed Rail will be a mainstay in our country, it’s just a matter of when. What do you think?